Location: Silverhill, Hastings, East Sussex. Starting GPS Co-ordinates: N50 52' 01.97" E000 33' 21.34"
Finishing GPS Co-ordinates: N50 51' 50.39" E000 33' 34.05"
To see: 1066 Country, the town of Hastings, including it's harbour, castle, caves, the old town, and the East and West Hills with their funicular railways. The town of Battle, with its Abbey and the actual site of the Battle of Hastings, is a 15 minute drive to the north of the town. 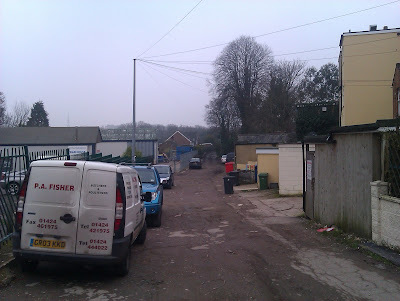 Upper Clarence Road is little more than a very short, straight, hilly, unadopted track that runs behind the row of shops and houses that front onto London Road (the A21) to its immediate west. Along almost its entire length it is pockmarked with sometimes sizeable potholes in its 'rubble and dirt' surface, and indeed a family saloon would find it exceedingly uncomfortable to drive along here. The northern end of the lane immediately prior to its junction with the A21 (see picture, right) is in rather better condition than the mid- and southern sections. There are restrictions to access for motor vehicles, which may be found on the signs at the southern entrance to the lane, where it strikes out north from Upper Park Road. Driving along this lane, other than for access, outside the hours listed is illegal. There is little else to report and no compelling reason to drive the lane other than, I suppose, for the experience of technically greenlaning in an urban environment!